Which is what separates Kice from everyone. What is terminal velocity? A product’s size, density and shape affect its specific terminal velocity. In theory, a specific product will start falling at a slow rate and accelerate until it reaches its maximum speed or terminal velocity. If airflow is upward, it will oppose the gravitational force on the product, thus reducing the rate of fall. If the air velocity reaches the product’s terminal velocity, the product will “float”, and if the air velocity exceeds the product’s terminal velocity, it will lift the product. When particles within a common product stream have differing terminal velocities, some will fall and others will be lifted by the air stream. The Kice Multi-Aspirator® efficiently and accurately removes products with low terminal velocities from products with higher terminal velocities. 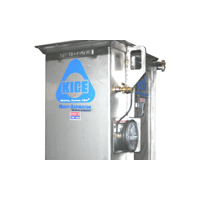 Kice performs tests on hundreds of different products each year. 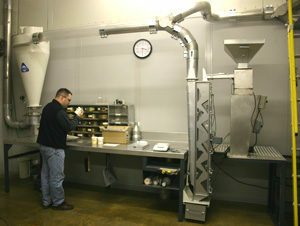 The Kice Testing Lab is able to simulate an actual system and accurately predict the viability of each product. 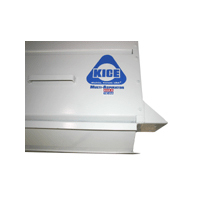 Through testing, Kice is able to determine the proper loading and the proper air volume required for each product. If you have a product that could possibly benefit from the use of a Kice Multi-Aspirator®, please contact Kice to set up a test. In general, the higher the capacity the wider the Multi-Aspirator®. As the required width increases, space sometimes requires the use of Double Multi-Aspirators®. This arrangement actually uses two units placed back-to-back with a common air outlet fitting. The other consideration is the number of passes. 4-pass and 6-pass units are standard, however 2-pass and 3-pass units are available when headroom is a major concern. E Series Multi-Aspirators® use the standard slide angle that has been engineered and proved most efficient for over fifty years. The E Series is the most commonly used model. F Series Multi-Aspirators® use the same, standard slide angle but have a shorter overall height than the E Series. 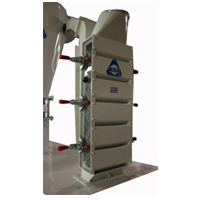 The F Series can be used on products that have higher bulk densities and flow well. 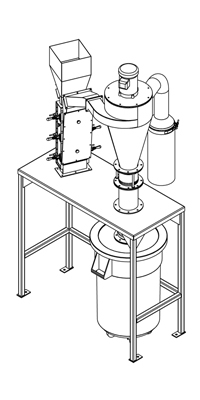 Custom designed units, typically with steeper slide angles, are available for products with very low bulk densities that do not flow well. These are designed based on our lab tests. Materials of Construction include mild steel painted Kice white, 304 stainless steel, polished 304 stainless steel with welds ground smooth and polished, as well as many other materials for unique applications. Removable Front Slides allow access into the entire interior of the unit. Support Feet secure the unit to a floor or support structure. Stock Inlets are flush with the top of the unit and have threaded holes for bolting inlet transitions on to the unit. 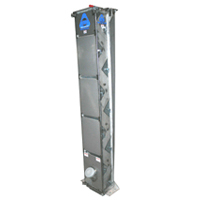 Bolt-On Access Doors on the end of each unit allow for access to the inside of the units for blow down cleaning. Different air outlet styles are available to fit virtually any field requirements. Turning vanes in the air outlet fittings ensure even air flow across the Multi-Aspirator®. Among these three styles there is also a Style D and Style A:A. 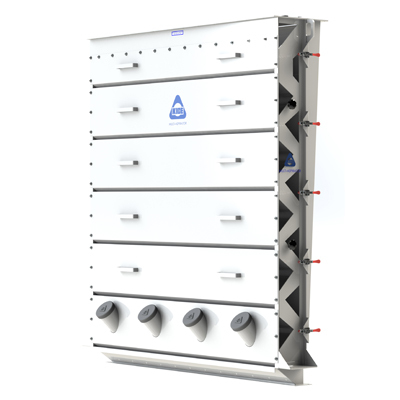 Air Inlet Filters provide clean air to the Multi-Aspirator®. Commonly used in the plastics and pharmaceutical industries. Anti-Static packages reduce the influence of static electricity on certain products. Commonly used in the plastics industry. Drop Front Slides provide easy access to the interior for cleaning. Inspection Ports below the bottom slide allow the operator to retrieve samples and monitor performance. 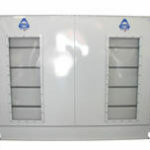 Lexan Doors with quick release clamps on the ends of the units allow visual inspection of the process. Plexiglass windows on the air outlet manifold allow for visual inspection during operation. 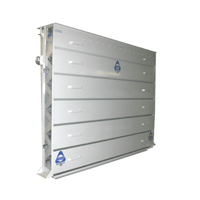 Return Air Plenums allow for a ‘closed looped’ system. 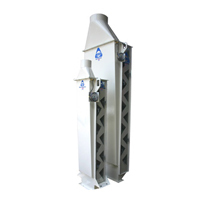 Typically fines are removed by a cyclone and the air is returned to the Multi-Aspirator®. This negates the need for a baghouse filter but is not highly recommend for maximum performance. 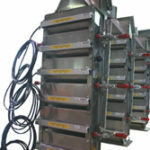 Feed Gates above the top pass help to spread product evenly across the width of the unit. Hinged Front Units provide quick and easy access to the interior of the unit. Commonly used on products that require regular cleaning of the machine. AR Steel or Ceramic-Lined slides increase the life of a unit that handles abrasive materials. 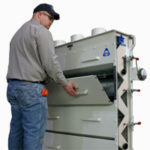 A Dockage Tester is a small table top unit that is used for testing samples of products. The unit is pre-wired and operated from a common 110V wall outlet. The unit weighs less than 150 pounds with a 9ft2 footprint. It is not uncommon for customers to require a portable Multi-Aspiration® System for use in several locations. Kice can assemble many different sizes of units on to a trailer. These are commonly used by owners of multiple grain storage facilities. They are also available as rental units for a weekly charge. This table top unit can be fed from a screw conveyor, overhead surge bin or by hand. 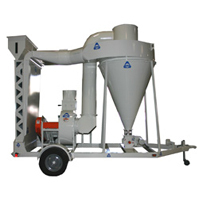 Ideal for small cleaning jobs or batch type operations. The suction fan is located in the top of the receiving cyclone. A cyclone discharges liftings into an air tight container below the support table. 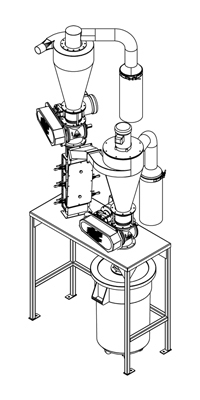 Similar to the 6DT8-2, the 6DT8-3 comes with a cyclone and airlock added to the stock inlet of the Multi-Aspirator®. 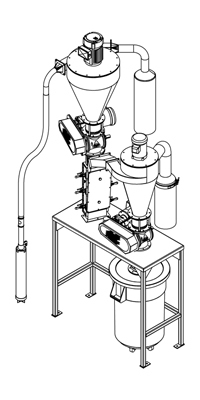 This arrangement allows for the system to be fed by a small pneumatic conveying line. 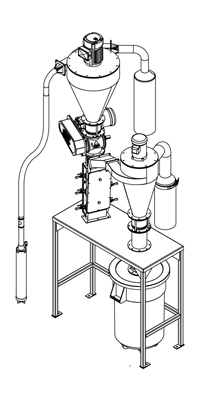 A cyclone with an internal suction fan is mounted on the stock inlet of the Multi-Aspirator®. This allows product to be conveyed by negative pressure to the system from a gaylord or other open container sitting next to the system. Similar to the 6DT8-4, the 6DT8-5 includes an additional airlock below the receiving cyclone/fan. This allows for an open top container below.